Park at The Talbot Inn, High Street, Ripley, GU23 6BB. Food is served until 2:00 PM and again from 6:30 PM Mon-Sat. No bar food available Sun. With your back to the pub, turn left towards the centre of the village. Pass historic buildings such as Cobham Cottages, Wyllie & Mar store, The Ship and the One-Stop shop. At the bakery turn left into Rose Lane. Opposite Appletrees, cross the road and locate a public footpath. Access is through an electrically operated security gate. At the farmhouse the footpath turns to the right and through a gate into the eastern end of the churchyard. Pass to the left of the church to view the grave of Conor, Eric Clapton’s son, alongside the south wall of the nave. Locate a pathway beyond the church hall that leads back to the High Street. Cross towards The Georgian House and turn right along the pavement. Pass the Manor House and turn left into Newark Lane but cross to take the safe pavement on the right-hand side. Ignore the first roadway on the right leading to Ripley Green, continuing along Newark Lane opposite the Ebenezer Strict Baptist Chapel. Just before the gateway into Dunsborough Park, opposite the entrance to Wentworth Close, double back to your right onto the Green. Keep left and gradually bear left to pass (on your right-hand side) a large hollow (formerly the village pond) and a children’s playground. The footpath passes through a small wooded area before affording a good view of Dunsborough Park. Merge with the main tarmac track and pass farm buildings and Dunsborough Cottages on your left; then swing left with the track. In 130m pass cottages and bear left to follow the sometimes muddy footpath that proceeds over two small footbridges to reach Walsham Weir. Despite the public footpath signs, do NOT cross the weir but turn left along the towpath with the canal on your right. Continue for 850m to reach Newark Lock. Turn right over the Lock footbridge and continue along the canal towpath. 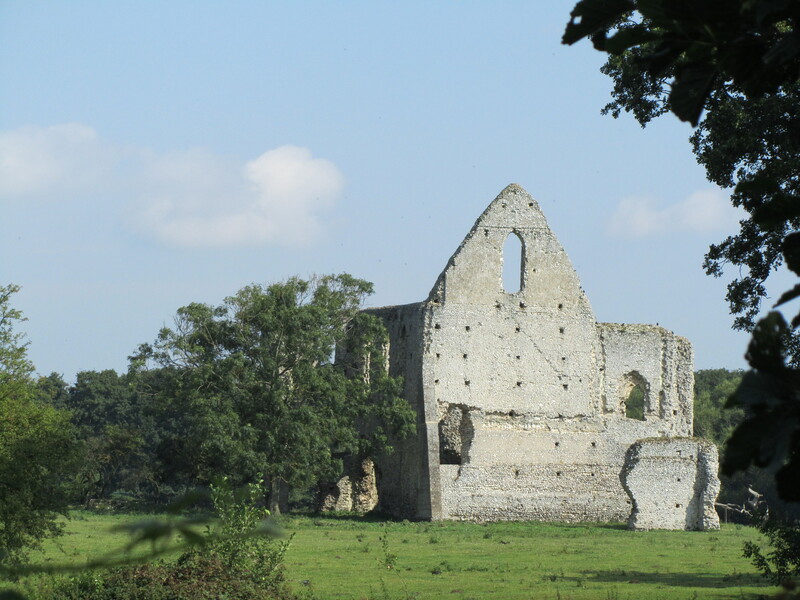 The ruins of Newark Priory can be seen across the meadows to your right. On reaching Newark Lane, turn left to cross Newark Mill Bridge by proceeding along the right hand pavement. This becomes a path behind trees that enters a small public car park and continues at the far end. When this path touches the road again, cross carefully to take the safe pavement now to the left of the road, but later cross back to take the third road on your right, Polesden Lane. A sign warns of the lack of a “footway” but the road shouldn’t be too busy. When it draws alongside a lake to the left, turn right onto a signed public footpath that crosses a stile. Keep left as this footpath forks away from the main driveway, between two wire fences. On reaching Papercourt Farm turn left onto the road, then right onto another signed public footpath that proceeds past farm buildings, through the wrought iron “David’s Gate” and over a subsequent wooden stile heading across a muddy field to Papercourt Lock (that was famously moved by the National Trust in order to construct a tiered tumbling bay). At the lock, do NOT cross the bridge but follow the sometimes wet towpath, with the canal on your left, back to Newark Mill Bridge. Cross as before, then proceed along the right hand pavement. When the pavement ends, cross the road with care and continue along the pavement on the other side. You have reached the half way point of the walk. Cross Bourne Stream Bridge. When the road bends sharp right in 200m, keep ahead on a rising path to pass St Nicholas Church, Pyrford on your right-hand side. Descend to the road. Proceed along the grass verge in front of Church Farm until the pavement resumes. Continue for 300m. Opposite a Sandy Lane sign, cross the road but immediately turn right again, through a gap by a gate. Go along the field edge parallel to the road for 60m, bearing left to follow the fence line downhill. At the end of the field, turn left and go along the track with fences to your right and left. In 200m, face a field gate alongside a smaller gate. Proceed through the smaller gate and maintain direction to follow the fence line towards a tall pylon, but before reaching that turn right to cross to a black fence. Keep this fence on your left till you go through a kissing gate and down the driveway to the road, where the timber framed Glebe House dating from the 16th century is to your right. Cross the road, going slightly right to enter a gate. Follow the footpath along the left-hand edge of a field and over a footbridge to reach a golf course. Proceed straight ahead to the first, second, third and fourth footpath marker posts (passing between two mounds just beyond the third marker). At the fifth marker the yellow arrow directs you to turn left towards a distant gravel path. Walk the full length of this path till you enter scrubland, where grassy footpaths go both straight ahead and right; keep right to eventually reach a road. Turn right at the road to cross a canal bridge alongside Pyrford Lock. Look for a kissing gate to the left of the yellow grit bin ahead of you, and go along this footpath for 400m. To your left, you may catch a glimpse of Wisley Church through the trees. Ignore tracks off, left and right; but at the T-junction turn right along the tarmac track, signed as the public footpath, leading towards the Wisley Golf Course clubhouse, 800m away. At the end of a small wood, follow the public footpath signs right along a meandering path, with the clubhouse away to your left, and on for another 600m. On reaching the wooden pump-house the footpath bears right. You catch one view of the RHS Wisley glasshouse to your left almost immediately, and better views of it later on. Reach the golf-course perimeter and the Wey Navigations towpath. 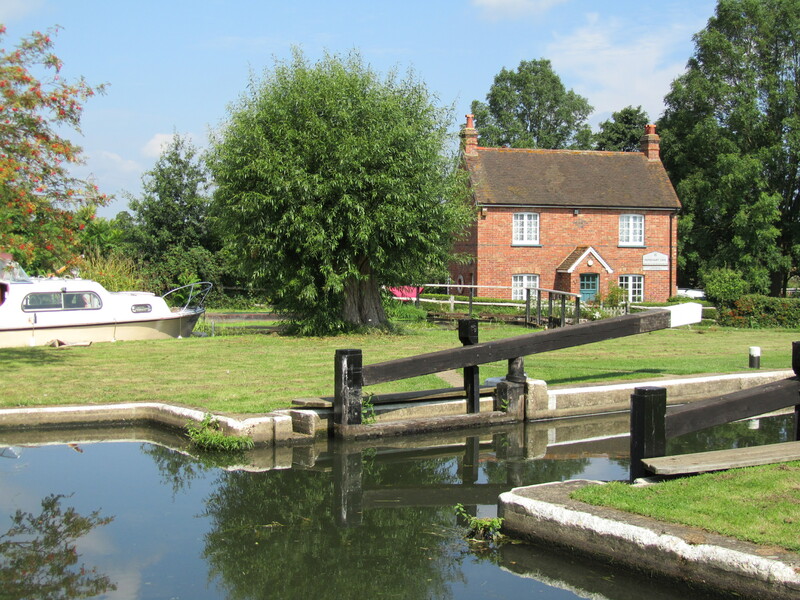 Turn left and continue straight along the towpath for about ten minutes until you reach the lockkeeper’s house. Just past the house turn left to cross the weir and then retrace your steps to Dunsborough Cottages. Despite the public footpath signs, maintain direction onto the common, taking the middle of three forked paths and heading towards a finger post at the tree line. Enter the woods alongside a bench and proceed straight ahead to find a sign announcing a bridleway within the woods. Turn right onto the bridleway, ignoring cross tracks and footpaths, until it narrows and ends with houses in front of you and to your left. Bear right onto a grassy path. Walk to the pavilion and turn left to reach the High Street. Turn left again and, opposite the estate agents, cross the road. Walk the full length of Ryde Close to reach the rear gate of the Talbot Inn car park. This route was last walked on 24 January 2019, and the directions were accurate then. Please e-mail me if you find any errors, or if you would like a copy in Word format, or if you would prefer a version that starts and ends at West Byfleet station (add 3 miles/ 1.25 hours).